From Mardi Gras festivities to local artists’ creations, explore Coastal Alabama’s art scene to view crowns, sculptures, paintings and more. We’ll inspire your inner artist. 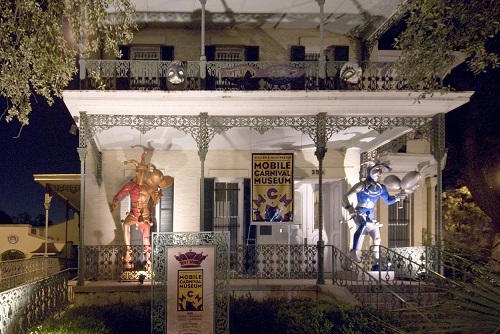 It’s Mardi Gras all year long at the Mobile Carnival Museum. The Mobile Museum of Art (MMofA) includes a permanent collection of close to 10,000 works of fine and decorative arts from America, Asia and Europe. This collection spans periods from classical antiquity to the present day. Surrounded by walking paths, a pond and a park, it is a beautiful place to spend the day and is the spot for many lovely events year-round. With 90 interactive exhibits, simulators, displays, and theaters, the GulfQuest National Maritime Museum of the Gulf of Mexico is a one-of-a-kind experience. The maritime exhibits are housed on multiple decks of a life-sized replica of a container ship, so come ready to walk and browse. There are many places to sit and enjoy the view, both inside the museum and outside overlooking the Mobile River and the busy Port of Mobile. The American Sport Art Museum and Archives (ASAMA), located on the campus of the United States Sports Academy, is dedicated to the preservation of sports art, history and literature. It’s composed of more than 1,800 pieces across all media including paintings, sculptures, assemblages, prints, posters and photography. The free museum is believed to be the largest collection of sports art in the world. The Eastern Shore Art Center, located in beautiful downtown Fairhope, is free to the public and offers guided tours through the five galleries. Artists from all over the United States display at the Art Center in our annual Outdoor Art Show and ever-changing exhibits. Visit on the first Friday of each month for their monthly Art Walk with live music. Fairhope is a haven for artists. You can explore beautiful works of art at several galleries dotted across downtown including the Fairhope Artist Gallery, Kiln Studio, Seeley’s Gallery by the Bay, Lyons Share and The Garage Studio. Step back in time and learn about Alabama’s first sawmill and about the Federal Road and how this seemly sleepy little place called Stockton was once a major settlement, second only to Mobile. Fine art, glass, clay and more can be enjoyed—or even made–at the Coastal Arts Center in Orange Beach. Visitors can make their own art in the Center’s The Hot Glass Shop or The Clay Studio. The Gulf Coast Arts Alliance in the Waterway District of Gulf Shores provides many ways to enjoy arts and crafts. Once a month, The Alliance hosts an art market. These markets are held on select Saturdays all day long at Waterway Village. Both local and regional artists are showcased along with local musicians, unique demonstrations and kids’ art activities. Orange Beach’s Indian and Sea Museum is a perfect stop to make during a Tuesday or Thursday exploring the area. The museum houses local artifacts and memorabilia relating to Orange Beach’s Native American and fishing heritage. The majority of exhibits were donated by local families. For almost 50 years, The Foley Art Center has served the Gulf Coast area with our Cultural Enrichment Programs in the local schools, scholarships for students seeking advanced degrees in the arts, and art classes for children and adults. From the dreams of 15 local citizens, it has become a vital force in the Cultural Development of Baldwin County. Annual events include a Fall Art Competition, annual Trim-A-Tree held at the Tanger Outlets and each Mother’s Day weekend Art in the Park, a fine Arts and Crafts show, is held in the John B. Foley Park.